The former Lucasfilm employee turned his massive 'Star Wars' collection into a record-breaking museum that every fan can enjoy. It is probably safe to say that Steve Sansweet is the ultimate Star Wars fan. After years as a journalist, he joined Lucasfilm for what has got to be the greatest job title ever: Head of Fan Relations. During his time there he became an established author, penning definitive books about Star Wars fandom including the Complete Star Wars Encyclopedia, Star Wars: 1,000 Collectibles – Memorabilia and Stories from a Galaxy Far, Far Away, and others. He even helped launch StarWars.com. Through it all, he was the go-to voice that connected Lucasfilm to its most dedicated fans. But when he retired in 2011, he found himself with a very geeky problem: Where would he put the literally hundreds of thousands of Star Wars collectibles he had amassed over the years? The answer to his action figures, movie art, and movie memorabilia storage problem was Rancho Obi-Wan, the non-profit museum Sansweet built to house his collection. Located in Petaluma, CA, fans can visit and tour what is the officially, according to Guinness, the world’s largest Star Wars memorabilia collection, and learn just what it means to be a Star Wars fan. Inverse spoke to Sansweet about fandom, weird collectibles, and keeping a non-profit afloat. One room at Rancho Obi-Wan among Sansweet's 350,000 collectibles. When did you start collecting memorabilia? I’ve been collecting since the beginning! I grew up loving science fiction and watching cheesy movies of the ‘50s and the TV shows of the ‘60s. I started to collect some older Japanese battery wind up robots and spaceships and things in the 1970s, and then Star Wars came out and blew me away. The merchandise became part of, and eventually overtook, my collection. When did you realize your collection was becoming a significant part of your fandom? It was when I was still a reporter and then a bureau chief at the Wall Street Journal. But collecting was totally separate from eventually working at Lucasfilm, and it just grew because I started meeting people there and began writing books about Star Wars. There’s just something about Star Wars that was the right movie at the right time to just grab me. It was one of the first movies that had merchandising for it. In the ‘20s and ‘30s there had been Mickey Mouse toys, or others inspired by comic strips or Buck Rogers or Flash Gordon, but not movies. It was very different from the way it is today. When did you get the idea to turn your personal collection into Rancho Obi-Wan? It was towards the end of my job at Lucasfilm where I began thinking about where to go. We moved to Northern California in 1998 and I was looking for property with enough space to house my collection. The property here on the outskirts of Petaluma actually housed chickens. Petaluma was actually the largest egg-producing city in the U.S. up through World War II, so there were a lot of abandoned chicken barns. I thought it was a perfect amount of space to convert for my private collection. To turn it into a business was something that didn’t come about until 2010 where we officially launched as a 501(c)(3) non-profit. How are the items in Rancho Obi-Wan categorized? We thought about this a lot. You could do it by character, by age, by movie, and so on. Instead we let the Force guide us. We made it into a storytelling way of curating the museum. You don’t just walk into the museum by yourself, we give tours that are all about the stories behind the items. In the beginning of the museum we have some stuff that’s awe inspiring, but as it progresses it’s in an order that tells the story of the merchandising of Star Wars, the fan input into that, and why it makes Star Wars so different than any other major franchise. To me, Rancho Obi-Wan is a great response to people who say the merchandising has ruined Star Wars. Merchandising is important because it was there in the off-times. The merchandise was everywhere, and even if mom hadn’t seen the movie she knew who Darth Vader or Luke Skywalker or Yoda was. Before home video came out it was buy these figures for a $1.97 and play with them by yourself or with friends, and you could recreate scenes from the movies or make up new stories. It was smart. A long time ago, in a galaxy far, far away, somewhere in Petaluma, California. My one favorite item is a simple canvas banner. It shows how Star Wars was reaching out to the fan community a year before the first movie came out. There was a guy named Charles Lippincott who was the first head of merchandising for Lucasfilm who understood comic book geekdom because he enjoyed it himself, so he decided he needed to take Star Wars directly to the fans. 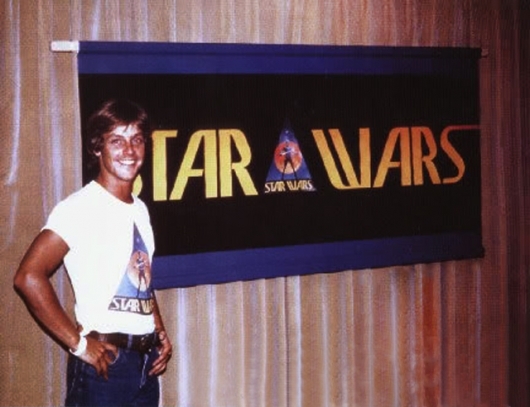 There were about four or five major conventions in 1976, but he took Star Wars to the early San Diego Comic-Con, World-Con when it was in Kansas City, and brought this banner. It was painted by Joe Johnston, the art director of ILM at the time. It had the famous Ralph McQuarrie image in the middle of Starkiller, an early version of Luke. I was lucky enough to get the banner years ago. It ties what Lucasfilm did in the early years and how they pioneered working with fans to what I did at Lucasfilm for 15 years as head of fan relations following in Charles’ footsteps. Star Wars is great because the breadth of the merchandising makes for some very silly tie-ins. Is there a particularly weird or off-kilter item in the collection that you enjoy most? Tons! 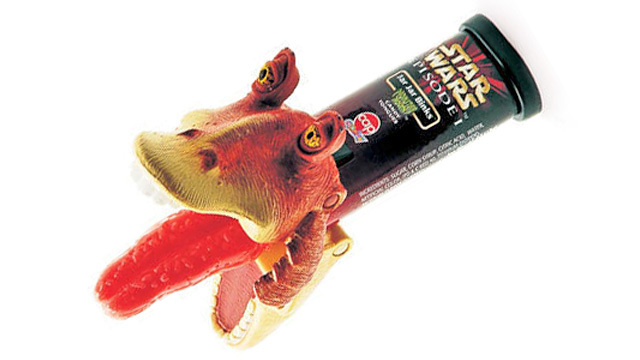 The strangest licensed piece is the Episode I Jar Jar Binks candy tongue. But people do all sorts of crazy things. There’s a card series severed limbs of Star Wars, which is a recurring theme in the movies. People all over the world make action figures of me in Star Wars gear, which is scary, especially a Yoda one that looks like me with long green ears. What’s your criteria for adding to the collection? Do you turn things away? Running a non-profit isn’t a very lucrative kind of thing, and with about 350,000-plus items in the collection, even with our large chicken barns we’ve sort of run out of space. So I’m much more selective with what I purchase. Some licensees donate things to us. But we only want the items that resonate and continue the story. What does the future hold for Rancho Obi-Wan? Will you just keep it within its means for now or see where you can grow? Our board of directors is discussing that in depth right now. I’d like to see this museum and the collection to continue, but it raises many questions. Non-profits always struggle to raise money and keep going, but I’d like this collection to stay together and be available to fans. It’s the only eclectic collection of this magnitude. You learn a lot about the fan community and the fan passion for Star Wars through the collectibles.